Earthy, super soft flannel from Japan is always a winner. Our Blue Rust Flannel never gets old. This style uses cotton flannel cloth from one of the finest mills in Japan. A traditional plaid pattern, this cotton has a deep blue base that is ringed by warm browns and a muted chartreuse green that make up a great rusty backdrop. We selected a buttery soft lighter weight material that pairs perfectly with Autumn, allowing for a great layered look. We pre-wash to enhance the feel and to reduce shrink. This fabric just begs to be worn with a crisp dark pair of jeans. We'll be the first to try it. Our fit starts with a beautifully tailored body, not too slim, but definitely fitted. High armholes keep the body lines clean. The length hits just right so it looks great tucked or untucked. Scooped out sides give the untucked look a bit of extra style. A traditional button down collar is secured with two side buttons and one back and has a nice soft roll. We labor over every construction detail. Extensive single needle stitching is used throughout. All our closures are made from true mother of pearl. A finely folded locker loop sits over a box pleat on the back yoke. The front placket is also pleated, made the right way, using a true two piece construction. The feel is more substantial and the effort higher, but it's the right way. An angular chest pocket completes the front. Our cuffs are double button with rounded corners. Button downs that are made in the USA using our quality of material and construction are typically priced at $175 to $300. The Gustin model, with your support, lets us do much better. We set out to create a fit that gave a bespoke tailored-looking fit, without being overly snug and restrictive. Our shirt fit starts with a beautifully tailored body, not too slim, but definitely fitted. High armholes keep the body lines clean. The length hits just right so it looks great tucked or untucked. Scooped out sides give the untucked look a bit of extra style. If you're inbetween sizes, or unsure, we suggest going with the larger of the two sizes you're considering. Lay the shirt flat with buttons fastened and the back pleat pulled tight. Take the measurement from fabric end to fabric end and double it. The length at the center back from the base of the collar to the hem. 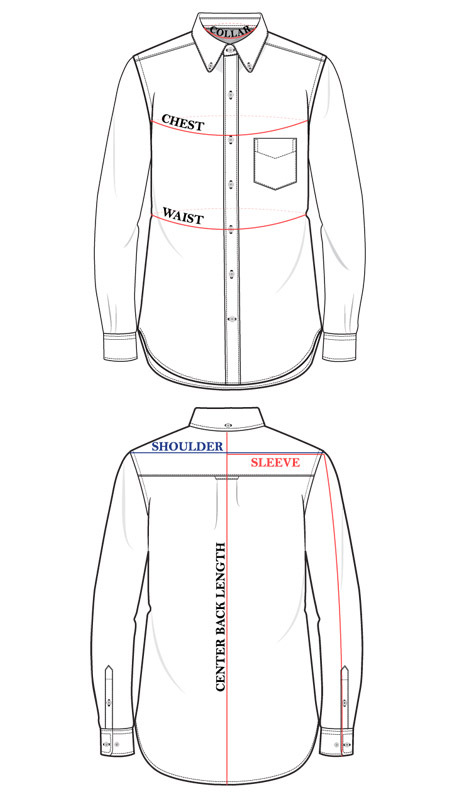 Measure from the center of the collar to the shoulder seam, then measure from the shoulder seam to the end of the cuff and combine these measurements. Unbutton the shirt and lay flat. Measure the length from button to buttonhole.